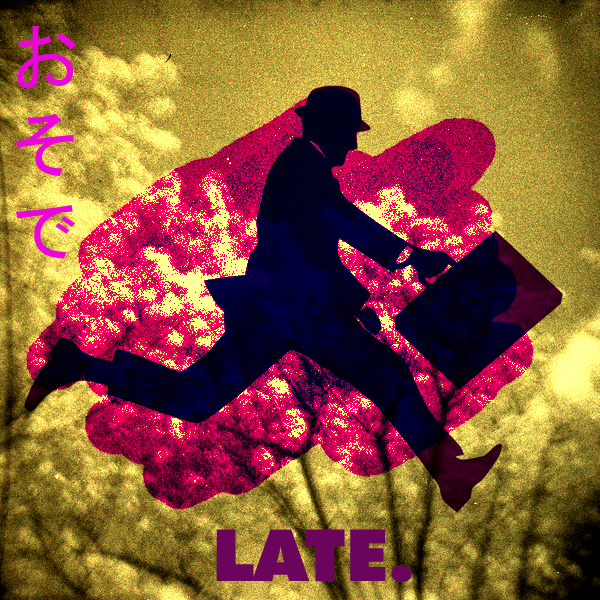 On Being Late to Work in Japan | This Japanese Life. Posted on March 9, 2011	by E.
I know someone who showed up to work 3 minutes late to his job in Japan. He lost an hour of vacation pay and then sat at a desk with nothing to do for the next 7 hours. This can tell you a lot about Japan’s work ethic. The Japanese work force has more vacation days (25) than the typical American (16). The workday on paper in my office is 9 a.m. to 5 p.m. And yes, the country – the size of California – is amazingly still ranked third in the world for total economic horsepower. But, the practical realities of things like vacation pay and work hours are a different matter. Anyone holding up Japan as a model for America’s workforce should come into any office in Japan at 8:30 p.m. and see if that’s what they want. Most workers will stay in the office until the supervisor leaves. In turn, that supervisor won’t leave until his/her supervisor leaves. As a result, the Japanese workday is effectively 12-to-14-hour shifts, often followed by mandatory bouts of social drinking (it’s bad form to turn down the boss). In America, this work week comes with overtime pay. No one I know is getting overtime pay. The extra 20 hours a week (and that doesn’t count Saturdays) is “voluntary,” since no one is asking anyone to stay behind. Furthermore, vacation (nenkyu) and sick days (Byoukyuu), while available, are taboo. Sickness is Japan means a fever. For anything else, you wear a mask to protect your co-workers and you come to work. Of course, everyone has a generous number of sick days. They just don’t use them. In my office, if a worker has a fever, or a broken back, there’s an unwritten (always unwritten) rule that you use your vacation pay before you use your sick pay. Similarly, you never go home from work, even if there’s nothing to do. That, too, is what your vacation days are for. There are perks that we don’t have in America. Japan enjoys high rates of savings and comparatively low income disparity, though that seems to mean it’s better at hiding its poverty. And while nobody gets overtime, workers get annual or biannual windfall bonuses that meet or exceed their typical monthly salary. There’s tremendous job security in Japan, too, thanks to a system of lifetime employment. But being able to afford a vacation is not a vacation. It starts in high school, where kids go five days a week, on paper. But that excludes “vacation days” and Saturdays – during both of which many students are still in classrooms. School starts at 9 a.m. and ends at 5 p.m. (on paper) but special classes and activities can run as late as 9 p.m. and as early as two hours before the official day begins. This means the school day in Japan can run from about 6:30 a.m. to 9 p.m. Which is why kids, like many of my coworkers, usually end up falling asleep at their desks. It’s the most common discipline problem in competitive schools, but it is also something of a national pastime. I have been amazed to see where people can sleep. On trains, in coffee shops, in fast food restaurants, on sidewalks. I’ve seen men sleeping while standing up outside of a convenience store. My train has passed by a man who took a nap on his bike while the train passed him. This is a packed rush-hour train in a city of 1.3 million people. As an American with experience in professional work environments, I’m familiar with salaried workers putting in more than their paper-contract hours, often without complaint. But the flip side is that, when there’s nothing left to do, you can leave. In Japan, it seems like the goal is maximum participation. Everyone always has something to do, even if there’s nothing to do. Full participation ensures the lowest unemployment rate and best customer service in any industrialized nation on Earth. But, I’m always expected to be grateful for my right to participate. I’m scolded for arriving 30 seconds late (it’s happened to me, once and never again) for a day where there is literally nothing for me to do. It’s like my presence proves that I have a purpose. If you can’t participate, you are useless – and that breaks up the ruse. Lose the ruse, and you challenge full employment for the entire country. In Japan, 100% of success is other people showing up. Which is why many American workers in Japan are often shocked at the mandatory meetings they have to attend, where they understand little and give even less. In turn, I’m sure the Japanese are stunned by the laziness of their new American co-worker, who goes home at 5 p.m. and shows up at the start of the workday. This stereotype – that foreigners lack the Japanese work ethic – contributes to a sense that the Japanese are distinctively capable of living in Japan. A lifetime of social conditioning prepares Japanese natives for the burden of job expectations. Workers who have gone abroad and lived outside of the Japanese system are often incapable of readjusting to it, even after a year. Companies in the 1980s were notoriously wary of hiring native Japanese with foreign experience, because of the perceived differences in work attitudes, a bias that can still complicate life in modern Japan. Western foreigners are excluded from many of these responsibilities and expectations. It can create a real imbalance, in that foreign workers, especially the ALT cohorts, can enjoy the perks of Japan’s brutal work ethic, customer service and full employment without any effort on their own end. In that sense, Japan strikes me as a great place to live, as long as you don’t need a real job. This post, written soon after my arrival in Japan, has been subject to some much-deserved scrutiny. In retrospect, it was unnecessarily universalized from my own experience to cover the whole of Japan. I’ve edited it for accuracy. I’ve also removed some incorrect Japanese, which was quite embarrassing. Thanks to everyone who (politely) commented with corrections! This entry was posted in Audio, Culture Shock, Tradition. Bookmark the permalink. Ahh, but its OK to SLEEP in meetings. Try doing that in the US or Europe. True on many levels (also found it funny that the ad at the end of the article was for pizza, lol). Nonsense. I don’t have the stats to pull up at my fingertips, but most overtime pay is unpaid in America. It largely has to do with the unemployment rate, and the miserly unemployment insurance system we have. People are too terrified of complaining about unpaid overtime for fear of retribution from their boss and getting fired. Also, the average number of hours the American works is still *more* than the average Japanese worker, although the official numbers probably don’t count social drinking with your boss. If I recall, the average American works 100 hours more per year than the average Japanese person and 400 more than the average Frenchman. Sure would be nice if you found some stats. I don’t know if an average american works more than an average japanese. But in higher earning fields (I can never remember white collar from blue collar, I believe the latter is for low earning fields) in most states they don’t have to pay you overtime so therefore they don’t. I think the only state requiring OT pay on all employees in california. But if you make over $22.50 (differing state by state) and you are a full time employee (even contractors don’t make 1.5x pay) you do not have to pay them OT. Most salaried employees work 45-60 hours a week and for that extra 5 – 20 hours? Not a damn dime. “Japan enjoys high rates of savings”, but since their interest rates have been near zero for decades, they get no further ahead than a N.American saving half as much. Not at all, the difference in interest rates is a matter of about a percent, and the Japanese save a lot more than 1% more than Americans are able to. I do feel somewhat guilty when I have nothing going on at work. Somehow the Japanese staff manage to look so busy all the time, even when they have nothing much to do. It’s an art form I swear lol. It would seem as though we share some overlap in yet another post. and as soon as I posted, I thought I’d swing by and see what you had up in this area. I would like to know where these stats come from, as well. I’m an American working in Japan. I work as an ALT, directly hired by my city. I work full time but our contracts are designed to be 45 minutes short of full time, so the ALTs don’t get sick leave. A week of pneumonia means a week without pay (and, in my case, being reprimanded for being sick too long.) We are not entitled to overtime; it’s considered “volunteer work. Being late, regardless of the reason, results in a loss of pay and all of your duties are stripped away. To be honest, it is to be expected since English teachers (eikaiwa and public schools) are so easily (and leagally) exploitable. This is because you have the unfortunate, but all too common, happening of working for a bad company. Not all ALTs get screwed like this, but a great deal do. I suggest finding a different company. I have grown tired of reading well-intentioned folk suggesting that finding a different company is a solution to the sickeningly rampant abuse of labor contracts with foreign workers in Japan. TBQH, even foreigners hired to teach at university level or work in companies can be subjected to part-time or subcontractor status loopholes and forced to pay their health insurance entirely out off meager wages, work without earning paid vacation time or eligibility for sick leave – let alone ever gaining a stable position at the 3 or 5 year mark. The ALT you are running your mouth off at was DIRECTLY HIRED BY A BOE which was a stated MEXT goal that for the most part never happened because it is very hard to implement. I am 100% they are a PREMO ALT. A typical Japanese BOE is about the pickiest direct client imaginable. What I do know is, regardless of the reasons, these worker abuses are happening on a large scale and creating immense unhappiness and unstable working conditions within the foreigner communities and in isolated foreigners throughout the countryside. It is not as easy as blaming dispatch ALTs as if they made a bad decision then telling them to pick up their life and find better employment. Funny, because I’m not subjected to this. And neither is anyone at my company. You might also want to look in the mirror when talking about “running your mouth” at people. Because your diatribe fit that description to a T.
Notice where I said it was common and unfortunate? Notice where I said my suggestion is to find a different job? Why? Because this is Japan and the fact of the matter is it isn’t going to change because a few foreigners are getting screwed. Japanese screw their own employees. They also don’t give two pisses about foreigners. Combine these two facts and you end up with what we have. So, rant all you want the fact is it’s never changing. So the only option left is to do something about it yourself and hope you get lucky with a different company. On a last note I never blamed anyone. Quit being a douche and try reading what people wrote for a change. This article is verbatim out of a book i bought off amazon. Forgot the title. Oh well.. Anyway, I am American and work for a Japanese company in Japan. This article (or excerpt from a book) is 100 percent true. My Japanese work day: morning aerobic (radio taisou) at 8:30am; however on Fridays we take turns cleaning the office at 8:30am. There are many meetings that waste time and delay my actual work. Everyone stays until 8:30pm (if no overwork) however up to 11pm if there is still work to do. Cant take work home and if I i do cut out early (lets say at 8:30pm) and the team is still working, I may miss a 10pm meeting or new work assigned to me, so I am forced to stay until the team is done working. Lets not forget the drinking parties after work which are fun only for the first day. In reality they are expensive and just hurt your wallet. I can also talk more about Japanese pigeonholing workers, and obtrusive micro management where my team leader looks at my computer screen all day, but not going to get into that now. Hope this extra info was useful to those who want a non-English job in Japan. Thanks for that info- but, this article is my own and I haven’t approved it for reprinting- could you tell me what book it appeared in? I was absorbed in studying Japanese for over 4 years. Then I got hired at the Japanese company that I’ve been working at for almost 4 years. I use only Japanese at work, which was my dream, so needless to say it’s gotten pretty good. But the more I am around these dooshbags, the more I realize it was a waste of time. I get shot down. I get no bonus. My pay is not much better than an English teachers. My superiors are authoritative. I have only gotten one raise in 3 years. So I stopped going to the majority of the company events at my Japanese company. go cycling, bowling, or some other form of event. We work 60 hours a week, and are expected to do this. I cut the number of events from around 52 per year to 5 or so. There is also a company trip to Australia in the planning. I don’t wanna go to this either, so I decline.. They create a committee called the “Recreation Committee” and put me as chair member. I organize the first event on company time, and of course don’t attend. Now they are saying it is mandatory that I attend future events! All of this is for my own good because it promotes togetherness for the company. And what’s good for the company is good for me, according to their logic. and at companies back home in America. I just can’t take this crap anymore! To know who is receiving OVERTIME pay in America, you need to know the difference betwen exempt and non-exempt. Exempt employees are not subject to the Fair Labor Standards Act wage and hour laws that require overtime pay. As such, exempt employees do NOT earn overtime in or outside of CA. Non-Exempt are legally required to earn overtime for either over 40 hours in a work week (federal statute) and in CA anything over 8 hours in a day (state statute). I’m an English teacher in Tokyo, and I hear my students complain about working late and having no time to rest or spend time with their families all the time. My Japanese is more than good enough to work in a Japanese company, and if I did I’d probably be making more money, but at what cost? I’m sometimes frustrated that I can’t really use much Japanese at my current job, but then I think of the stress working in a Japanese company would mean and I think, at least I’ve got my sanity and my “me” time! How does this compare to working in China? Is working in a US company in Japan better in terms of work life balance? Absolutely. As long as most of your bosses are Western. I now work at Morgan Stanley through a vendor, and they treat you like a human. Nice environment if you look past the typical large corporation issues. I heard IBM is mostly Japanese, so it functions more like a Japanese company. Make sure you interview mostly with non Japanese, and you don’t get asked if you drink. They will likely have many nomikais. Plus, drinking should have no positive impact on work, unless you’re applying for stuntman on Jackass. This is great. Love the post and the comments.